The last year was insanely crazy for us at Sound RIDER! as we celebrated our 10th anniversary with no less than 10 events! We thought we might get away with doing less in 2010, but lucky you, it does not look like that's going to happen. Which means between what we're doing all year and the many other great events going on you can keep yourself busy just about every weekend with motorcycle activities throughout the year. Are you a subscriber? The best way to keep up with our events as they develop is to be subscribed to Sound RIDER! It's free and takes only a moment to do. To do that CLICK HERE now. It's time to break out your calendar and start marking it up. And while you're at it, be sure to block the vacation time with your boss sooner rather than later. 2010 here we come! The Dave & Tom Clinic Series - January-April. Or you can call it the Hough & Mehren show. Riding Skills Guru David Hough and Sound RIDER! publisher Tom Mehren will be presenting a number of clinics for riders throughout the winter and into early spring. Sometimes together, sometimes apart. David's clinics will deal with various riding skills topics such as cornering techniques and ways to make yourself more visible. Tom's clinics will deal with a number of topics including motorcycle photography, gear tips and tricks and upcoming Northwest MC events. Clinics in Seattle will occur the first Saturday of each month from January to April at Ride West BMW. Cafe to Cafe Grand Tour - April-September. It was just too much fun in 2009, so we're bringing it back in 2010. The Cafe to Cafe Grand Tour takes you to 15 designated cafes in the Northwest. These will be different locations from those we used last year. You ride to them anytime between April and September,. The more you hit, the more points you gain and winners are rewarded with commemorative plaques during a special luncheon event in October. Look for details to be posted here in Sound RIDER! April 1st. Sound RIDER! Garage Sale - May 15th (tentative)Like any other retailer, our online store is overstocked and we need to reduce our inventory on a number of items. But we're going to wait until riding season is a bit more in swing to do it. We'll be setting up for a day somewhere in the Puget Sound area and we'll have all kinds of specials going on. Details will be revealed in the April issue. Road Trip 2010: Oregon Backroads - June 21-25. You got $10k to blow on an international tour this year? Neither do we. But we know how to put on a good tour, so this year we're putting on two here at home and you can join in on the fun. The first is our Oregon Backroads tour, designed to take you to some great locations and ride some outstanding roads hidden in the Oregon interior and along the coast. For this one, all the roads are paved and we don't care what you ride (as long as it doesn't break down and isn't too loud!). Details will be revealed in the February issue of Sound RIDER! For the dates of our Sasquatch dual sport tour keep reading. Oregon's Smith Rock. Don't miss it on the Oregon Backroads Tour! BMW MOA National Rally - July 15-18. If you plan on attending this shockingly large event (9,000+), you'll find us there with a vendor booth. Be sure to stop by, say hello and spend several hundred dollars with us. Rally in the Gorge - July 28- August 1. AKA Sportbike Northwest, Sport Touring Northwest, Dual Sport Northwest & Maxi Scoot Northwest. Now in it's 8th year, Rally in the Gorge is an amalgamation of four rallies run simultaneously in the same location. What's nice about that is you can bring several bikes and join in on whatever activity suits you at the time. Take a sportbike clinic in the morning and run a dual sport route in the afternoon. You get the idea. But even if you only have one of the four types of bikes this rally is built for, you'll have an endless number of possibilities to keep busy each day. This rally gets better and better with each year and it's infectious with more than 70% of the attendees returning year after year. Look for the usual cast of top-rate speakers and clinicians to be on hand. More details with each passing month right here in the pages of Sound RIDER! Rally links are on the lower left of your screen. Sasquatch Dual Sport Tour - August 23-27. 54 riders enjoyed our Sasquatch Dual Sport tour last summer so we're doing it again. This time our route takes us through the more scenic areas of Oregon (this is not the OBDR route). You'll traverse gravel roads to have lunch at Mt. Hood, cross through the Cascades on dirt and pavement to get to Crater Lake and wind your way up unpaved coastal backroads to reach your final destination of Astoria after five beautiful days of riding. Look for more details in the spring. International Motorcycle Show - December 10-12 (tentative dates). 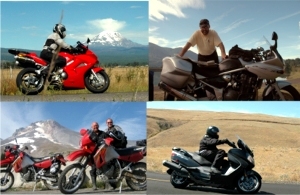 Look for our 10th annual Northwest Motorcycle Display during the 2010 International Motorcycle Show.